A Soleil-Babinet Compensator is a continuously variable zero-order retarder (wave plate) that can be used over a broad spectral range.The variable retardance is achieved by adjusting the position of a long birefringent wedge with respect to a short fixed birefringent wedge.The wedge angle and fast axis orientation is the same for both wedges so that the retardance is uniform across the entire clear aperture of the Soleil-Babinet compensator. 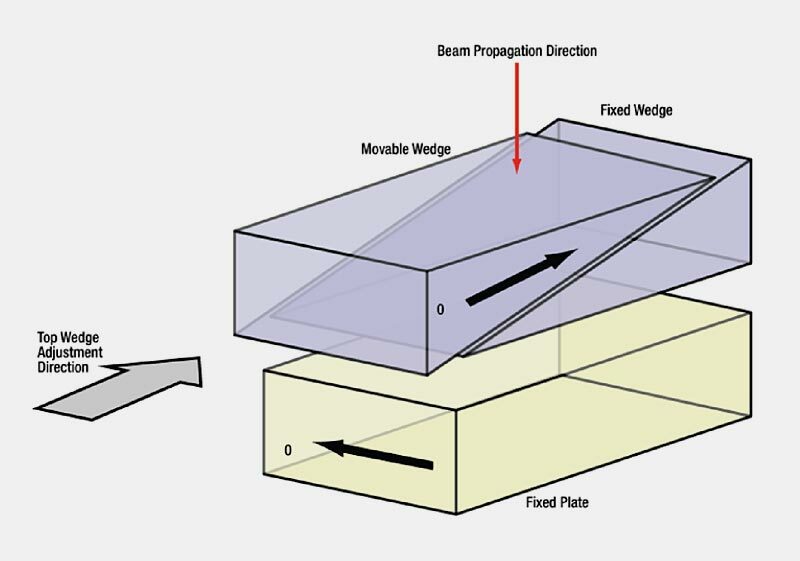 A compensator plate is attached to the fixed wedge, with its fast axis orthogonal to both the fast axis of the wedges and the propagation direction of the light. When the long birefringent wedge is positioned such that the total thickness of the two stacked wedges is equal to the thickness of the compensator plate, the net retardance of light passing through the Soleil-Babinet compensator will be zero. The position of the long wedge can then be adjusted with a precision micrometer in order to create a retardance transmitted beam of light. To calibrate the Babinet compensator with monochromatic light. Where α is angle of the prism & β is angle of minimum deviation. Determine precisely the Babinet compensator interfringe at the wavelength of the green line of mercury. This is about 2.4 mm. 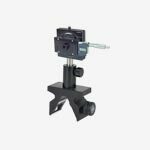 The polarizers are spaced apart with their polarization axis rotated 90° to each other so that no light is transmitted. At this point the polarizers are crossed. Insert compensator in between the two polarizers. Adjust the tip/tilt so that the compensator is perpendicular to the optical beam. Turn the Babinet compensator to find the extinction. Fringes of high contrast should appear. Using micrometer, record the reading between two null position of the fringe. 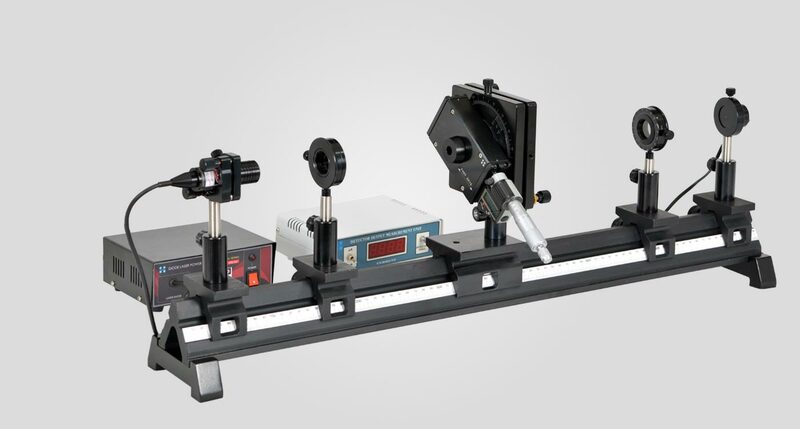 Using Babinet compensator, ordinary and extra-ordinary rays of light are produced. These light rays interfere and the interference fringes are observed. By introducing the sample sheet in between the incident ray and Babinet compensator, shift in the fringe pattern is produced. The fringe shift is measured and the differences in the refractive indices of the ordinary and extraordinary rays are calculated.